If you are studying in a part-time program with the intention of obtaining a certificate or a diploma, you must submit a request for internal admission with the Admissions Office and Registrar. Admission conditions for each program are listed under the credentials. If you believe that you are eligible to obtain a diploma or certificate, you must complete a Diploma/Certificate Request Form at Registrariat@collegeboreal.ca. Persons aged 60 or over who wish to register for a course are eligible for a reduction of tuition fees. Only the basic tuition fees will be the same as for a regular student. These reduced fees does not apply to all courses ask for more details! If the start date of a course is delayed or if a course is cancelled, we will communicate with you using the contact information indicated in your file. 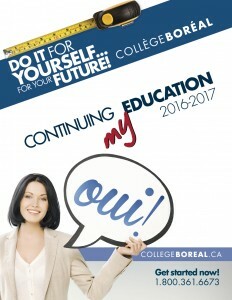 In preparing this guide, College Boréal has used all available information and made every effort to ensure its accuracy. However, the College is not responsible for changes that may occur after the publication of this guide or any errors it may contain. The College reserves the right to cancel a course at any time if the number of registrations is deemed insufficient. Tuition fees and ancillary fees are due upon registration. A complete refund is granted if a course is cancelled by the College. A partial refund (minus $10.00 administration fee) is granted in case of withdrawal up to 10 days after the start date of a course. A partial refund (the cost of the course minus administration fees of $10) is provided up to 10 days after the course’s start date.A complete refund is granted if an EDP course is cancelled by the College. Unless otherwise indicated, a complete refund is provided in the five working days before the start date of the course, except for motorcycle courses with the code EDA1041 or EDA1319 (no senior reductions). A request to withdraw from a course must be sent by email to the Collège Boréal campus where the course is offered, at: registrariat@collegeboreal.ca | Non-attendance in a course does not constitute a notice of withdrawal. To obtain further information or help with registration, please contact the Admissions Office and Registrar by phone at 1.800.361.6673 and ask to speak with a information officer, or by email at FC@collegeboreal.ca.